Blazer in Super Smash Bros. for Wii U.
Blazer (ブレイザー, Blazer) is Roy's up special move, extremely similar in function to Marth's Dolphin Slash attack. When performing this move, Roy soars upwards with his flaming Binding Blade, which has the ability to set opponents ablaze. However, the move differs from its counterpart in several ways, notably in that its recovery vector can be controlled to a larger extent at the expense of some vertical coverage. Blazer, performed on Bowser in Melee. This move can be aimed by quickly pushing the control stick in a direction after the initial up special, making Roy move anywhere from directly upward to a 45 degree diagonal on either side, at the expense of some vertical distance. Like Marth's Dolphin Slash, this move can be reversed by moving the control stick backwards immediately upon activation, where it produces a stronger hitbox. Unlike in Marth's Dolphin Slash, it does not grant invincibility at the start of the move. One of Blazer's unique traits is that its first hit has rather extreme fixed knockback; while this is intended to help drag opponents upwards into the rest of the attack, in some situations this can result in the move being almost a one-hit KO on very light characters (such as Pichu, Jigglypuff, and Mr. Game & Watch). This move has odd knockback properties in that it scales based on falling speed and weight instead of damage. Its odd scaling properties, however, prevents this from being an effective KO move except perhaps on extremely light characters on stage with a low ceiling. Blazer returns as Roy's up special move in Smash 4. 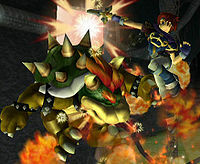 It is mechanically the same, with Roy sending himself upwards with a fiery slash, although Roy now has a new animation while using it: he slashes upwards with a reverse-grip slash before swinging his sword sideways slightly during the final hit, sending opponents flying. Although basically the same move from Melee, Blazer has been significantly buffed, both in terms of a recovery and an attack. As a recovery, Blazer travels slightly less distance than the Melee version, but it retains more horizontal momentum near the peak of the slash, allowing Roy to boost himself slightly once he finishes the move. A more significant buff is its increased ability to be angled: if angled fully forward or backwards right after activation, Blazer gives Roy a completely diagonal recovery (much more than in Melee), allowing him to reliably recover from horizontal distances where Marth or Lucina would be unable to. As an attack, all hits connect better with each other due to the first hit's significantly lowered set knockback, and the final hit does significantly more knockback and no longer scales based on falling speed, giving Roy a new viable KO move. As a side effect, because of the first hit's lower set knockback, it can no longer KO the lightest characters at 0%. Blazer deals 5 hits for a total of 16%, and begins KOing middleweights at 120% on the stage if aimed up, though it loses some of its power in midair. The apex of the move also gains more hitboxes there unlike the Melee version, allowing the attack to deal more hits and have a longer lasting hitbox overall. Due to the attack's new knockback angle, it is one of the more reliable stage spike attacks, especially due to its multiple hits and ability to drag opponents towards the sides of the stage. The grounded version also grants Roy armor during the first few frames (similar to the intangibility granted by Marth's Dolphin Slash) allowing Roy to use it to jump out of dangerous situations (such as being caught in a jab infinite) or as an out of shield KO move if he is grounded. "Rise into the air while swinging the flaming sword. Input a direction to change the jump's angle." Blazer as shown by a Skill Preview in Ultimate. This page was last edited on March 7, 2019, at 00:25.